Features 50 of the most scenic and spectacular walks and hikes in the Ozark Mountain range. 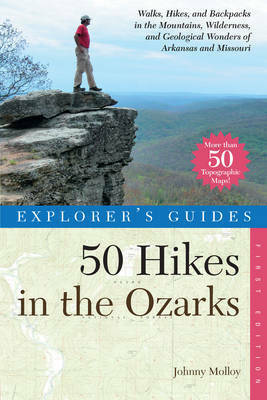 This new guide from prolific hiking author Johnny Molloy features tours of military battlefields, geological walks, and dips into caves, crags, mines, and other enchanting spots throughout the Ozarks and along the Ozark Highlands Trail. Specific emphasis is placed on the most scenic destinations and wild backcountry areas that make the Ozarks unique. The hikes range from 1 to 18 miles, with varying degrees of difficulty to accommodate every age and ability. Each hike is accompanied by a topographic map, hike difficulty, instructions for getting to the trail, and detailed descriptions of the hikes, including trail junctions, stream crossings, and interesting human or natural history you'll find along the way. 50 black & white photographs, 51 maps. Johnny Molloy is a full-time outdoors writer and the author of several books in Countryman's Explorer's 50 Hikes series: North Georgia Mountains, South Carolina, The Ozarks, and Alabama, plus more than thirty other books.